The School of Interdisciplinary Studies (IS) has adopted the use of technology in their lessons to create new and different platforms for students to learn, experience and reflect on the issues that would impact their community. Lecturers have created “learning-on-the-go” opportunities for students to learn beyond the classroom through selected online communication tools and social platforms. Ng Su Chia and Chan Keen Len (IS) are two lecturers who have leveraged on technology to create these innovative learning spaces for their students in their modules that focus on Citizenship Education and the awareness of broader social issues. Click on the following link to learn more about how they have used technology in their modules. The study of Immunology is perceived as being difficult to students as it is content heavy, has many technical terms and abstract concepts. Many students would learn this topic through memorizing the content without a real understanding of the immune system and how it is related to other aspects of Microbiology. To help students overcome these challenges, Dr Low Pey Yng (School of Life Sciences & Chemical Technology) and Dr Lim Gaik Bee (Centre for Learning & Teaching Excellence) worked together to create an “Immunology Game” for students to learn these difficult content and concepts through an online gaming environment. Click on the link to find out more about the design of this game! 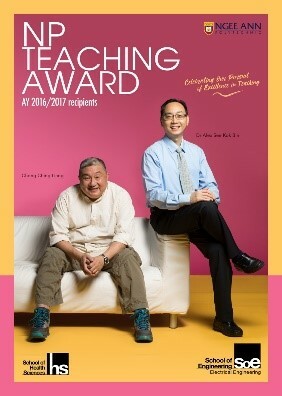 The NP Teaching Award (NPTA) is an NP level teaching award presented each year to staff who are exemplary in their pursuit of excellence in teaching, effective triggers for learning, nurtures professional & holistic student development, and show purposeful engagement with continuous professional self-development. They are individuals nominated by their students & peers and validated by management as outstanding T&L talents in NP. In AY 2016/2017, our NPTA recipients are Dr Alex See (School of Engineering – Electrical Engineering Division) and Mr. Chong Ching Liang (School of Health Sciences). Learners Together did an “email” interview with both to find out more about their thoughts on their role as lecturers.